According to Forbes, Carlos Slim earns approximately $5000 per minute, while his net worth is about 5% of Mexico’s GDP. Let’s find out what helped Carlos Slim to become one of the wealthiest men in the world. Carlos was taught the value of money when he was a little boy. His father, who originated from Lebanon, gave his children 5 pesos every single week, but he did it under one condition. He asked his children to keep records, so they could track their expenditures. Carlos spent his money on “tasty things”: soda, donuts, and tortillas. Carlos Slim still keeps his “child accounting book” in his office. One of the richest men worldwide made his first investment at the age of 12. He purchased Banco de México shares. Father’s education wasn’t such a waste. Later Carlos graduated from college and decided to build his empire Carso Grup. He began his career as a stock trader. Having accumulated enough money, he founded the Inmobiliaria Carso estate agency. However, the young entrepreneur didn’t stop and broadened the range of his entrepreneurship. Thus, he was engaged in soft drinks, printing, real estate, bottling and mining, auto parts, aluminum, and tobacco industries. 1980-1982 was the turning point for Carlos Slim. The Mexican economy collapsed, and most of the major business leaders were in a panic. Thus, they began to sell their companies for extremely low prices (literally for a pittance). The Carso Group founder wasn’t so confused and started buying up different entities. By the early 1990s, Carlos Slim’s Carso Group acquired multiple mining, metallurgical, and chemical companies. He also was interested in banking and hotel businesses. Then Carlos Slim started to think about telecoms business. In early 1990 his Grupo Carso acquired governmental Telmex (which was earlier privatized by Mexico). However, this acquisition was not scandal-free. The fact was, the real cost of this entity was about $12B, while Slim purchased it for $400M. This was where strong links to senior officials significantly helped him (particularly president Carlos Salinas de Gortari). This acquisition caused a lot of public resentment against Carlos and the authorities. Then a set of investigations ensued, but this led to nothing, authorities let it slide, and Slim Helu walked away free, with the telecom business. In 1996 Group Carso was split into three companies: Carso Global Telecom, Grupo Carso, and Invercorporación. Therefore, telecoms business became Slim’s top priority. In 1999 Carlos decided to expand his business beyond Latin America. By 2003, he became a major figure in the USA business scene. He acquired OfficeMax, Borders, Barnes & Noble, CompUSA, and many others. Carlos usually stayed away from IT, but when his relatives gifted him a laptop, he changed his mind. Yes, his business can be called a family-clan kind. Three of his six children currently manage large holdings of the empire. 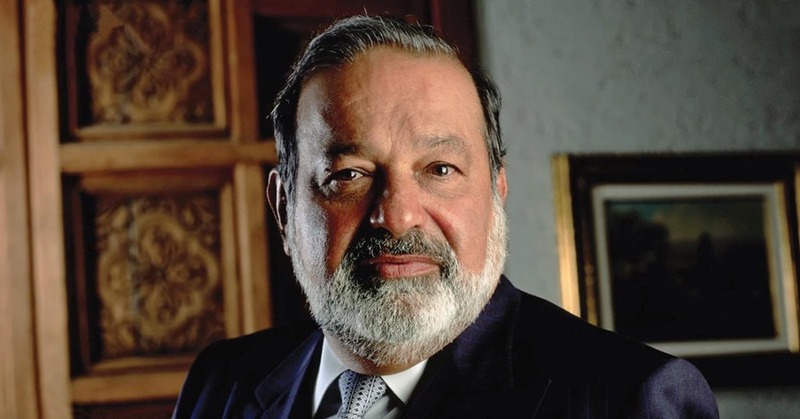 Carlos Slim Domit, an elder son, is Chairman of the Board of America Movil, Grupo Carso, Grupo Sanborns and Telmex. Patrick and Marco Antonio are in charge for part of America Movil and Grupo Financiero Inbursa. 1: The main aim has always been clear – to get rich. He says if a one wants to get rich, they have to work for it despite failures, mistakes, and obstacles. The desire to get rich has to be #1 whatever happens and whatever it takes. Thus he recommends working hard, nonstop, and walking persistently towards the aim you pointed out. Carlos used to say that he is fortunate, because he had such a teacher as his father. As we mentioned above, his dad taught him how to count his money, and what an investment is. The tycoon recommends not to put off what you want, and not to postpone a cherished dream for tomorrow/next Friday/next year etc.